I wrote this back around 1993, and had it up on my archive site. Yesterday I had reason to look it up, and first looked here, figuring that at some point I must have reposted it. But a search didn’t turn it up, and I thought that I should correct that oversight. It’s interesting to now look back to it, and to see how little my attitude/approach to the subject has changed with another 23 years of book conservation experience. Mark Twain, in his early work Innocents Abroad, described how Christian craftsmen were given special dispensation to enter mosques in the Holy Land in order to install or repair the clocks which called the faithful to prayer. Sometimes I feel like those clockmakers, and wonder how they reconciled their non-belief in Islam with the service they provided that faith. Did they feel the grace of Allah’s touch in their craftsmanship, or in the heartfelt thanks and blessings they received from the faithful? I am a book conservator in private practice in the Midwest, and a significant number of the books I work on are religious texts, usually but not exclusively bibles. While I am a deeply spiritual person, largely in the Christian tradition, I do not consider myself to be a person of faith, and I have doubts about the existence of a single divine entity by whatever name. Still, I respect the religions of others, and am comfortable working on the books that deeply religious people bring to me. Repair of holy scripture is an odd thing for an agnostic to do. My friends of faith say that it is part of my path of spiritual growth, perhaps the way I will be led to discovery and belief. Perhaps. But I consider it more that I am keeping faith with my clients. A bible, particularly a personal bible which is used for daily prayer and inspiration, is probably more private and revealing than a diary. I can tell from the way the binding is broken, from the wear on the pages, from the passages highlighted or notes made, what is important to the owner, what their innermost fears and hopes are. I suspect that often I know more about these things than they do themselves. I am a therapist of paper and glue. These books are precious, not in a monetary sense, but in a personal one. I can see it in their eyes when they bring the bible to me, asking me if it can be repaired, worried less about the cost than the time it will be absent from their lives. The repair of these books is usually simple and straightforward, just an hour or two of labor. I can fit this work in between larger projects, and get the bible back to the owner in a matter of just a few days. This news usually comes as a relief. But almost always the owner is still hesitant let go of the book, hands slowly passing it over as they search my face for a clue as to whether they can trust me with this part of themselves. Just as a veterinarian receives a beloved animal who needs treatment with gentleness and grace, out of concern for the owner as much as for the pet, I receive their bibles as a sacred trust. And when they come for their bibles, I am sometimes embarrassed. Embarrassed because of the praise, the occasional blessings, and the overflowing joy they feel. It is times like this that I feel that my hands are not really my own, my craftsmanship and skill not something that I can take pride in, but a rare gift that comes from outside of myself. And I am grateful, whatever the source, for this touch of grace that enters my life. Stories are one of the most powerful forces of persuasion available to us, especially stories that fit in with our view of what the world should be like. Facts can be contested. Stories are far trickier. I can dismiss someone’s logic, but dismissing how I feel is harder. And the stories the grifter tells aren’t real-world narratives — reality-as-is is dispiriting and boring. They are tales that seem true, but are actually a manipulation of reality. The best confidence artist makes us feel not as if we’re being taken for a ride but as if we are genuinely wonderful human beings who are acting the way wonderful human beings act and getting what we deserve. We like to feel that we are exceptional, and exceptional individuals are not chumps. Before humans learned how to make tools, how to farm or how to write, they were telling stories with a deeper purpose. The man who caught the beast wasn’t just strong. The spirit of the hunt was smiling. The rivers were plentiful because the river king was benevolent. In society after society, religious belief, in one form or another, has arisen spontaneously. Anything that cannot immediately be explained must be explained all the same, and the explanation often lies in something bigger than oneself. I don’t mean to pick on religion here, just to point out that this is a very human trait. In fact, I have often wondered whether it is a defining human characteristic, something which could easily set us apart from other intelligent species. It’s fairly easy to imagine how intelligent, sophisticated, technologically-advanced civilizations could be constructed by species which don’t have this human gift for storytelling. You can, after all, have curiosity and scientific inquiry, art and poetry, even narrative and historiography, without having something like literary fiction. * I think that it might be interesting to write a science fiction story/series based on the premise that humans become the storytellers of the galaxy, because of our unique ability to create explanation narratives unrelated to reality. So I wander into this nuclear reactor . . . I had reason to look up this item the other day, and was surprised that I hadn’t ever posted it to the blog. So, in honor of St Pat’s Day (well, OK, not really, but there is a connection…), here’s a little something from my old archives from a few years ago. This morning’s news that the NRC has declined to force nuclear power plants to take additional precautions to prevent the breach of a nuclear reactor’s core by attack with a jetliner comes as little surprise, given the Bush administration’s attitudes about actual security issues. But, as always when I hear such news reports, I was taken back to a sunny spring morning some 30 years ago, when me and a couple of college buddies wandered into a nuclear reactor. It was the weekend of St. Pats day, and we were at the University of Missouri – Rolla to party with a friend of ours who was an engineering student there. I think it was Friday morning, and our friend had some classes he had to attend, so myself and my two friends decided to just explore the campus a bit (we all attended schools elsewhere). I had considered Rolla for school myself a few years previously, when I had been thinking of going into physics (a dream derailed by poor higher-math skills). So when we came across the research reactor building, I wanted to have a look. We just wandered in. No, seriously. We just wandered into the building, through a couple of sets of doors, and soon found ourselves standing at a railing, looking down at the glowing blue core of the nuclear reactor. In this day and age it is hard to imagine such a thing – and even at the time it seemed more than a little odd. A few minutes after we came in, a nice fellow who fit the stereotype image of a science professor came over to us. Short, grey, bearded, balding, wearing a white lab smock over his shirt and jeans. He sort of looked us over, asked what we were up to . . . and then gave us an impromptu tour of the place (after tagging us with personal dosimeters). It was fascinating, to me at least. The reactor core at this facility sits at the bottom of a large swimming pool, about 20 feet down. That provides all the necessary protection from the radiation generated from operation of the fission reactor (which doesn’t produce much power, and doesn’t use the sort of fuel used in nuclear weapons). Herr Doktor explained all this to us non-scientists, and also explained the eerie blue glow coming off the reactor (which was then in operation). It was a color like I’ve never seen before or since – a soft electric blue that was both intriguing and repulsive. 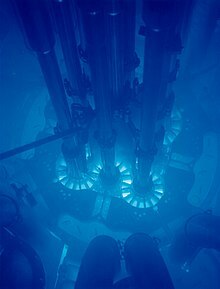 I knew what it was, having been interested in physics: Cherenkov radiation, caused when the radioactive particles generated by the fission reactions are faster than the speed of light in the water. But it’s the sort of thing that lasts in the memory, embedded there in a way not unlike a religious experience – hard to describe, or explain, or convince others of, yet extremely vivid for the one who experienced it. Now, I’m not religious. I’m an atheist, in fact. I understand what that blue glow is – yet, whenever someone claims that they have had a religious experience, I can tie it to that same feeling I had on first seeing that other-worldly blue glow. Well, anyway, I had to share that personal experience, and add a bit of perspective on the changes we’ve seen in terms of security over the last 30 years.